It was 1993 and around the time that Jon Wells was doing Easy Lives for Commodore Force. Jon also had a nice little platform game being produced with some fantastic bitmapped graphics by Michael Smith. The game was ‘The Adventures Of Weebles – The Mysterious Isle’, a obscure little game with no real mention anywhere, especially within Jon’s diary pages in Commodore Force. Where did we first hear about this game?…. Through Easy Lives. A few installments of the popular cheat program included details in the scrolly about a new up and coming game. The main character, Weebles, was present on the main screen. If you remember the later version of Easy Lives which Jon revamped, there was a little boy sprite who ran across the screen many times. This was infact the main character himself, making a very rare appearance, which would turn out to be his only appearance. Thanks to Richard Bayliss, this sprite has been ripped out and put into a small special demo for GTW… just to show the main character. We’ve also put a download in for the game’s music which was composed by Feekzoid. The game was started by Jon Wells and Michael Smith in 1990 as a pet project. It was to be a Dizzy style game in a single load with around 40 screens. The early version had a smaller character based set of screens, but the guys decided to go one bigger and use bitmap graphics and turn it into a 4 level load (Similiar to Crystal Kingdom Dizzy I guess). All the maps were drawn up, but only one of the levels was completed (The Forest) which had around 30 screens. The game had quite a "Dizzy" feel to it, and certainly Michael Smith’s graphics were outstanding. They were so outstanding that Codemasters (Who Michael was working for at the time) stood up and noticed, and talk was of having the game completed for them and releasing. This could be another of the 20 lost Codemaster titles therefore. Richard Frost once got in touch with GTW and told us that he recieved a demo from Jon (After swapping a lot of letters over the years). The game had brilliant sound effects and was a flip screen game where you ran left and right. But you could also go up and down through ‘jittys’. The demo was very impressive. It seems the interest in the game died down, and Michael went off to University. 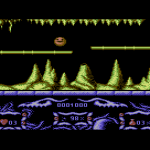 The C64 began to die out, and the game was put on hold when Visualize was started up. As support for Visualize was poor, and Jon had too many projects on the go at once, he culled things down by cancelling the project. Now Jon confirms that the game will never be completed, and has been added to the scrap list. Jon though tells GTW that he does plan to reuse some of the graphics that were done for the game. We have been given permission to give out screenshots, but a demo could follow in the future. On the shots page you will find some exclusive screenshots of the game in action, including a very early development shot of the game which was with the character based graphics. Could we see a cut down version of this game in the future? We certainly hope so… It looks great! "The Mysterious Isle graphics where done by Michael Smith. We started this off in 1990 as a small pet project and never managed to complete it. It started out as 40 screen single load game based on the Dizzy style, then later we decided to use bitmap graphics and turn it into a big 4 level load game. I remember creating full colour maps and puzzles on paper for all 4 levels, I think they're in the loft somewhere! Michael practially completed all the graphics for the first level "The Forest". Michael was working freelance for Code Masters at the time and when he showed them an early demo they were interested in seeing more when the game was complete. Each level was going to feature around 40-50 different screens and the demo I created for this has around 30 that Weebles can wander around. Maybe one day the graphics could be used to create a cut down version!?"